I bought a blythe doll a while ago, and have been dying to make some clothes for her. This weekend i whipped up a little sweater for her. It was quick and loads of fun. I knit it in the round out of some Lisa Souza sock yarn (Heels and Toes from Stitches West) then steeked it open and added trim (Sirdar snowflake – the tangliest yarn in the universe). the end result is like a jacket with furry trim. Doesn’t the photo look really artsy? That’s because I used my new $4 Kodak Duaflex II to take the picture. The technique is called “Through the Viewfinder” and you use a modern camera to take a picture of the image in the large viewfinder of the old Duaflex or similar cameras. I first noticed this technique through the Make blog, or Flickr, i can’t remember which. I’ve had my eye out for a suitable camera ever since, and I found one for only $4 this weekend. 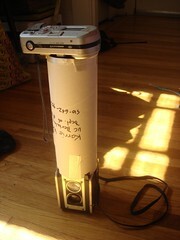 I just used a cardboard poster tube to support my old digital camera. No taping yet, but it would be nice to get rid of the light leaks. 8 Responses to "I knit a little sweater"
Wow, that is amazingly arty! Wow, that does look neat! And her little sweater is just darling. Hi there – I follow your blog and thought it was great that you\’ve discovered TTV – my husband ( http://www.adamgrahamphoto.com )does a lot of work with it and loves it. I love your shot – it looks perfect in TTV format! That technique is really cool!! What a great technique! That\\\’s one of the reasons I love your blog, you share such great ideas! I am so looking on ebay right now for a Duaflex. I love that this can be done film-less! We must have the wish list. I just got a Pullip and a Duaflex for my Bday! 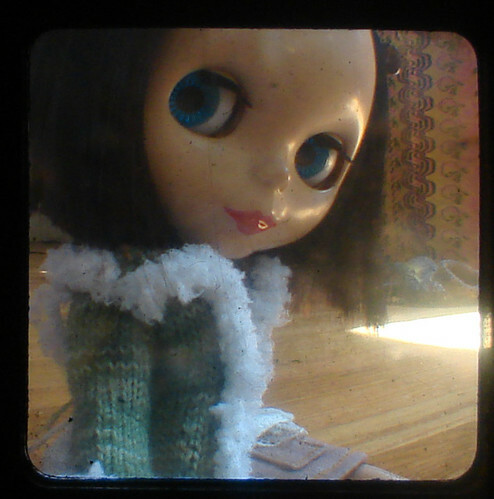 I love your ttv Blythe pic! Love that photography technique! She looks so vintage with the extra touch!